Pentel has been making writing instruments since the 1940’s. But 1968 was the big “break out” year for Pentel. This was when they released the Mechanica. 2018 was the celebration of their 50th anniversary. Alas, no re-issue was made. But it did indeed cause a spike in resale prices of the original mechanical pencil. So well made that examples are still in use today. What made the Mechanica so unusual is the tip protection mechanism–a sliding cylindrical metal sheath that extends down over the tip to protect it, then is retracted when preparing the pencil for use. Weight: Perhaps a little on the light side, but pleasantly so. You won’t tire from writing with it, while not feel like it’s inexpensive (as you would from a PG2 or PG5). Balance: Center of gravity is slightly forward. The metal in the front feels solid and provides ample grip. Feature: The sliding protective metal tip sleeve is most unusual and the most compelling feature. It works well and does the job. Convenience: It’s a somewhat long pencil at 15cm, but doesn’t feel uncomfortably long. The provided vinyl sleeve is just a tad short, and could be more robust (a little thin), but looks nice. 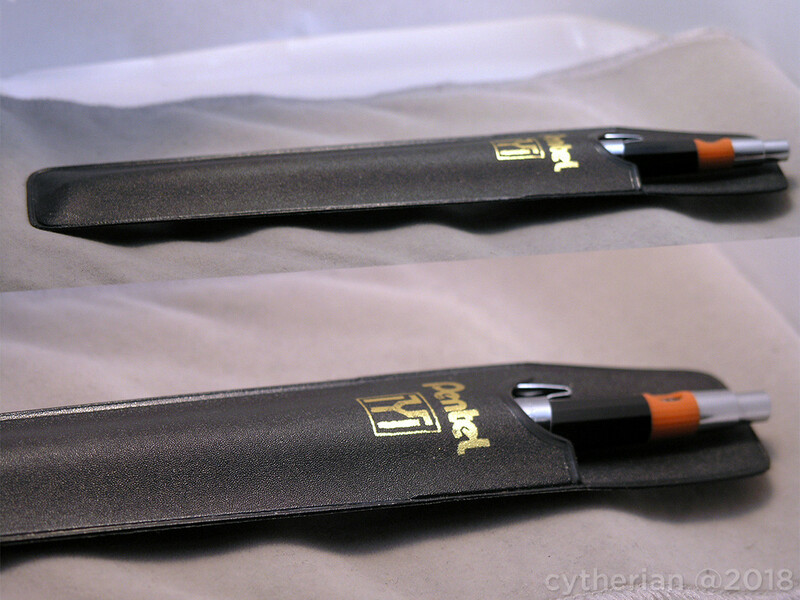 There is a removable clip that is a standard Pentel accessory (so if you lose it, you can take one from a P205). Mechanism: Feels luxuriously smooth. Tactile click without any tinny or hollow sound. The end button is metal (unlike black plastic with the lesser PMG twin). Design: This is simply a stunningly handsome pencil. I think the 0.3mm looks more distinctive, as the grid lines etched into the metal grip have black paint applied, whereas the 0.5mm is more “raw.” You can see the difference if you look closely in the photos. 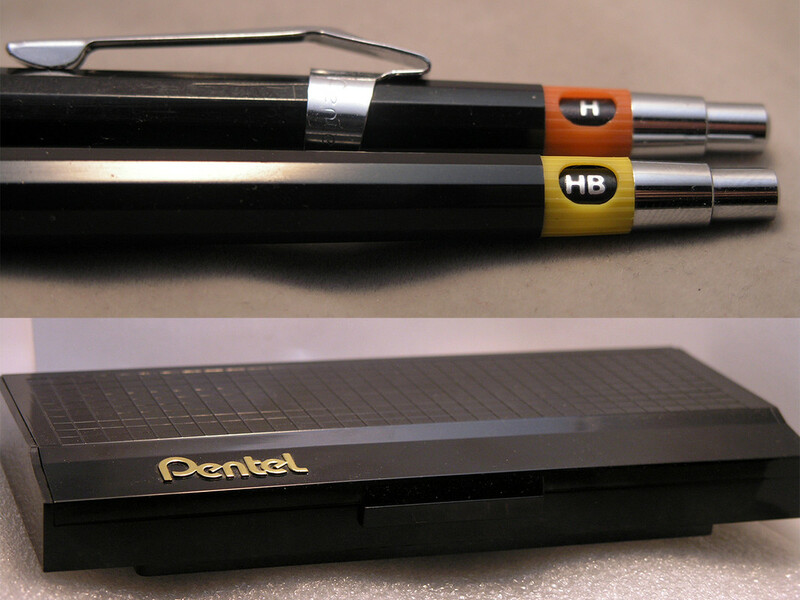 Pentel provided the Mechanica in a nice hard plastic hinged box, with some accessories. The clip is designed to be easily removable, so that when using the pencil there’s no feeling of the clip. The lead type indicator is easily changed by loosening the collar around it, turning to the loaded lead setting, then tightening. The rear plunger is a nicely machined cap. When removed to access the lead, there is no eraser. But there is a lead clearing tool in the cap. The quality and craftsmanship that went into this pencil are excellent and it’s no wonder why this is a very celebrated writing instrument. I’m glad to have gotten the 2 sizes that were available. They look almost identical except for the lead indicator color band and the cut lines in the grip section having black painted lines on the 0.3 mm, but left bare on the 0.5 mm. “Knurling” refers to a textured pattern cut or molded into the front section for added grip. A key aspect to using a mechanical pencil is the grip. You should be able to hold the pencil easily in a stable manner and not suffer any slippage while writing. Many non-drafting style pencils don’t feature any grip textures so they end up allowing your fingers to slide down as you write, if you’re writing for long periods. Drafting pencils are almost always fitted with knurling of many different types. I won’t go into the enormous range of variations for this installment, but may revisit the idea later. This photo provided gives you an idea of some more common ones. The Kohinoor and rOtring pencils use “diamond cut” knurling, as the crisscross cuts create small diamond shapes. The Staedtler featured here is using a box or grid cut. Some Pentel and Pilot pencils have used this type as well. The costly knurling cut process can be avoided by providing either molded plastic/rubber, or simple concentric lines cut into the section. The Pentel P200 series (the P205 being the most popular in 0.5 mm size) has a grid cut mold in the section area of the plastic barrel that does the job well, part of the reason why that series has become so ubiquitous in the arena of drafting style mechanical pencils. For most of the metal knurled treatment is done on stainless steel, so there’s no rust to worry about. Sometimes there can be corrosion or staining, but with the right technique and substance it can usually be cleaned well enough to look almost like new. Pentel has been making writing instruments since 1946, in the wake of World War II with Japan in shambles. But in just 2 short decades Pentel would evolve to become a major player in the affordable writing instrument arena, as well as a supplier of top tier drafting mechanical pencils. But Pentel’s real bread-and-butter lies with the lower tier affordable writing instruments. And of that, there are many. Most everyone knows the ubiquitous P205 (0.5 mm) pencil, which was teamed up with 3 other lead sizes (P203 0.3 mm, P207 0.7mm, P209 09.mm). 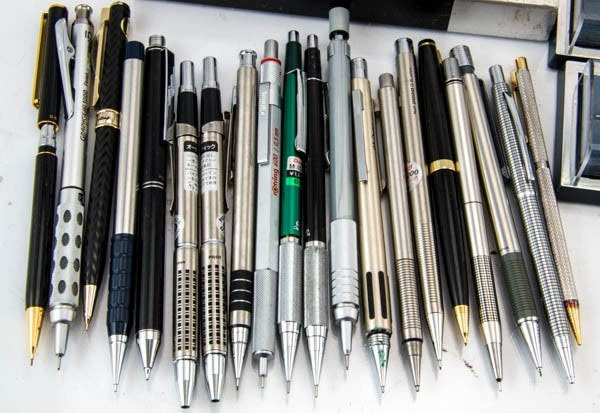 While Pentel had great success with the P200 line, targeted for more drafting audiences, they also released a variety of mechanical pencils with metal bodies. Some were made partially of metal, some fully (like the PG15). Of course, more metal the higher the cost. 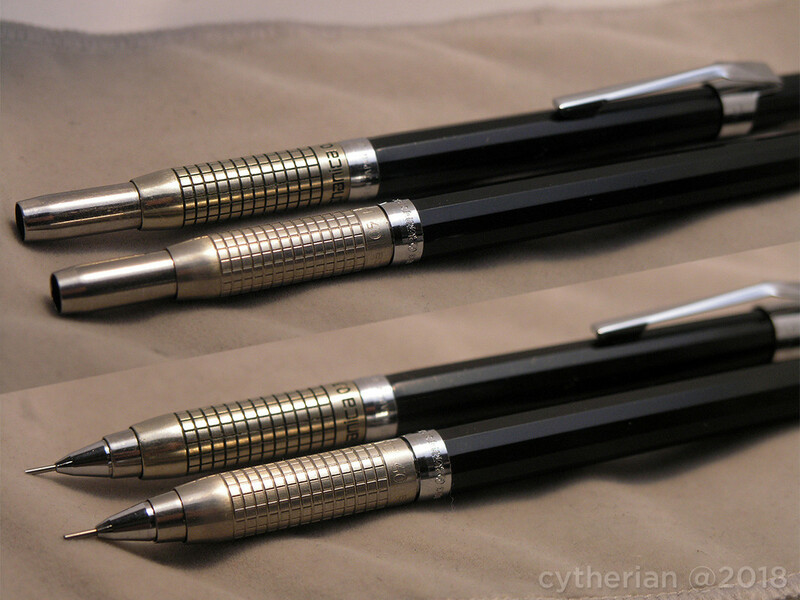 Pentel created an “SS400” series of pretty decent mechanical pencils that successfully pull off being inexpensive while looking and feeling more costly. Oddly enough, the SS455 was on the lower end of the price range, but now tends to be priced higher than the others in resale market. The SS465 looks more modern and possibly better made, but the silicone grip can be a big turnoff (they don’t tend to last more than a few years before turning to sticky gunk). The SS475 is majestic in all steel splendor, but the shape is little more than a straight tube and the grip etching isn’t very prominent. Ultimately, the SS455 is probably the better all around user pencil. The clip attach point is a little cheap looking and the enameled labeling wears off with sufficient use. But otherwise, the pencil has a good utilitarian appearance. The internals are mostly plastic, but where it counts, the clutch is brass and there is a stainless steel spring. Features: Sliding pipe guide, plastic ribbed grip, metal body, rounded metal end cap. On eBay you can periodically pick up an SS455 for about $10 USD. The SS465 and SS475 can at times be had for as low as $7 USD. In the spring of 2000, I’d been to France with my girlfriend at the time and she gently nudged me into trying out fountain pens. I’d started with a fairly inexpensive one. But I didn’t catch on with it. A few years later, my interest was reawakened when I stumbled across a fountain pen made by PILOT, called the Vanishing Point. I got one in Black Carbonesque, as shown. Amazingly innovative fountain pen. Sure looked very modern… but then I later learned this was but one of many earlier iterations that began back in the 1960’s, previously called a Capless pen. Rivera Pens has an enormous Capless Compendium Index that’s well worth a look. 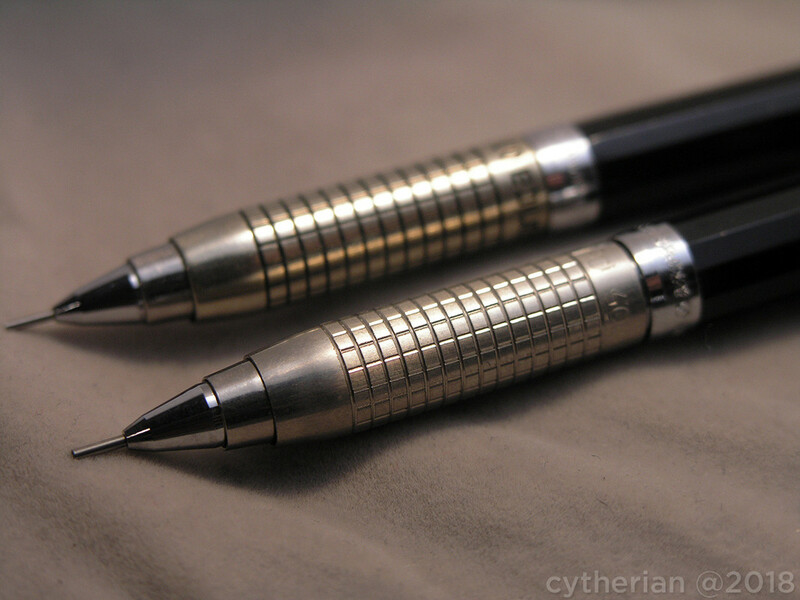 I would later acquire a few of those earlier variants of the Vanishing Point (Capless) pen. Not long after this point, I managed to find a few on-line forums to support the new habit and discover other people sharing the same interest. The Fountain Pen Network became my “place to go” for anything pen related. I got so involved, I even became a moderator and then an administrator for a few years. But then like any hobby, interest begins to wane and other life priorities take precedence. Around 2012, I’d dropped off from fountain pen collecting after amassing a pretty sizable collection, mostly focused on Japanese brands like PILOT, Platinum, and Sailor, plus a few German brands like Montblanc, Pelikan, rOtring and LAMY. NOTE: I’d previously written some fountain pen reviews that I’d hosted on a different site, but will eventually migrate those here. As a side pathway to collecting fountain pens, I’d managed to pick up some ballpoints and mechanical pencils along the way. Most fountain pen makers will produce companion writing instruments of the same styling as a matched set, so it’s often encouraging to pick up some of those as well. PILOT made particularly impressive efforts to produce high quality mechanical pencils that would often be priced fairly close to fountain pens. In the resale market, they wouldn’t garner nearly as high a resale value, but it was no indication of lesser quality. A particular motif that attracted me a lot was the stainless steel striped series, in black or silver stripes. I was compelled to pick up a silver striped mechanical pencil to go with my Pilot Custom fountain pen and rare MYU silver stripe fountain pen. The all steel construction on the outside continued on the inside as well. Really impressive quality. 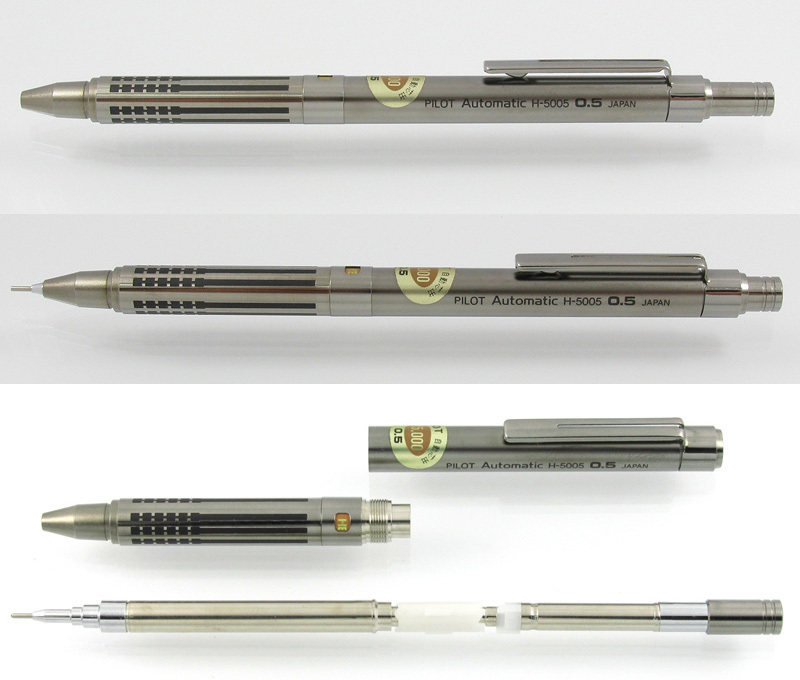 This style of mechanical pencil was designed primarily for general writing. I would later discover that there is a whole other half to mechanical pencils, namely those used for technical drawings and drafting. It’s on that end where some writing instrument companies took mechanical pencils to a whole new level. The Japanese were especially passionate about mechanical pencils, more so than anywhere else. While their most successful brands (such as PILOT, Pentel, Uni-Mitsubishi), produced many export models, there were always some models made only for the Japan Domestic Market (JDM). It was a way to make a nod to the Japanese culture that they would have something special, not available to foreigners. Some magnificent pencil models would be created, remaining mostly unknown to anyone outside of Japan. This went on from the 1970’s up through the 1990’s, when into the early 2000’s the priority of mechanical pencils changed (mainly due to widespread computer use). Gradually the very high end mechanical pencils were no longer being produced. The impetus was to produce affordable mechanical pencils to students, mathematicians, and artists. So companies started to focus on innovative features, such as lead rotation, greater lead protection, and a rekindling of fully automatic feed mechanisms. What happened to the high end drafting mechanical pencils? They mostly sat unused in various people’s homes and businesses, gathering dust or disappearing. Some old stationery shops would have them tucked away in the back inventory room, waiting for a customer inquiry. Eventually, as collectors began to start seeking them out, these wonderful writing instruments would be bought up for not much money. Not long after, as more collectors began pursuing vintage mechanical pencils, prices for unusual and originally very expensive models shot up in value. As a segue from having collected some PILOT Vanishing Point fountain pens, I was curious to know if PILOT made any mechanical pencils or ballpoints of this design. Sure enough, they did produce a ballpoint (but not a pencil). Clicky Post created a nice review about it, HERE. But why not a mechanical pencil? Well, in searching around for “Pilot Vanishing Point Mechanical Pencil,” I stumbled into that curious zone of vintage mechanical pencils. PILOT created a series of vanishing point mechanical pencils that don’t really share much in common with the fountain pen equivalent. The most common model you can find is the model H-1005. The 1000 is the initial series and the last 2 digits signify the lead size. So there is an H-1003 (0.3 mm) and an H-1007 (0.7 mm). Naturally, there is a 2000 series, a 2100 series and 3000 series. 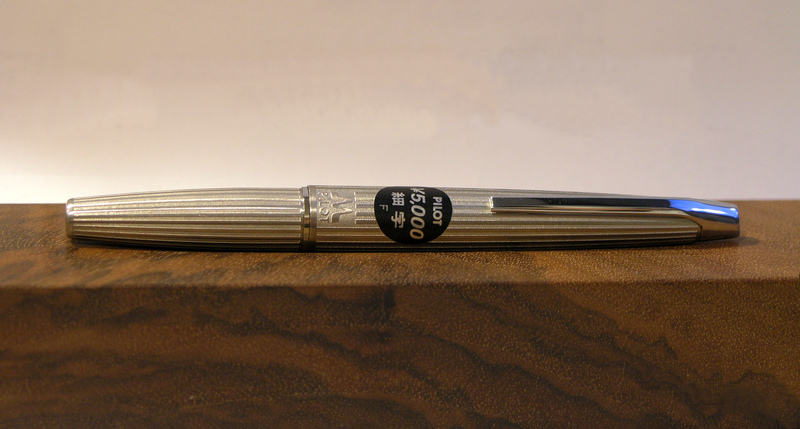 There is one more, but it’s almost not even worth mentioning (OK, it’s the H-5005… a gorgeous fully automatic pencil that was 5,000 JPY and produced in very little numbers, making it impossible to find for any kind of price that you might consider reasonable). What do they all have in common? A “vanishing point” or retractable tip. Most mechanical pencils have a fixed lead pipe guide, especially those used for drafting and other technical work. A retractable tip protects the pipe guide from impacts and bending/cracking. The challenge is that a movable point means it may have some movement to it when extended. However, most Japanese made retractable tip pencils would exhibit no play at all. Very impressive. 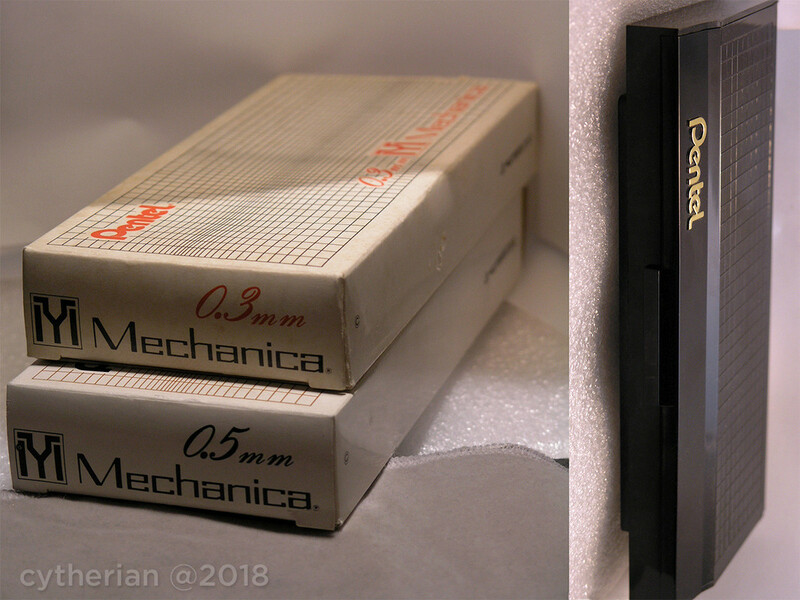 It was this “retractable” nuance that caught my eye and caused me to dig further… and turn this into a more serious hobby of finding and obtaining unusual and beautifully designed mechanical pencils. Sadly, I joined this hobby a bit late, as certain models I would definitely like to own are now seriously overpriced relative to other comparable quality mechanical pencils. However, I was fortunate to hit the timing well enough to acquire a decent number of really wonderful specimens. I’ll post a future write-up of the PILOT Vanishing Point mechanical pencil line and in time cover a number of unique, uncommon mechanical pencils. Isn’t that a stunning design? It almost looks like some sort of futuristic rocket ship. Meanwhile, it’s totally functional. Beauty in motion. This is what attracted me to vintage mechanical pencils. This is just scratching the surface. Upcoming will be a series of reviews on a variety of writing instruments, but the bulk of them will be focused on vintage mechanical pencils (which is my present collection focus). Stay tuned for more posts coming soon! You are currently browsing the Pen Museum blog archives for November, 2018.